The city of Ames, Iowa, a small town in the center of the state, is also home to Iowa State University. Next to Fire Station No. 2 on Chamberlain Street in the Campustown area of town, the pavement concrete is chipped, cracked and breaking apart. That’s because it’s the traditional delivery and drop-off spot for all of the area’s kegs. The city’s public works department knew the sidewalk needed to be replaced, but were worried that after a couple more years of kegs bouncing on the concrete that it would just have to be replaced again. So they came up with a more lasting solution. 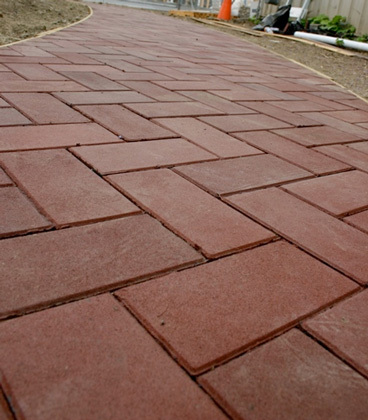 Next week Ames will install the first rubber sidewalk in town, which can take the constant pounding of full kegs. The sidewalk will consist of shredded recycled tires from a California company, Rubbersidewalks Inc..
Making the world safe for kegged beer, one sidewalk at a time.